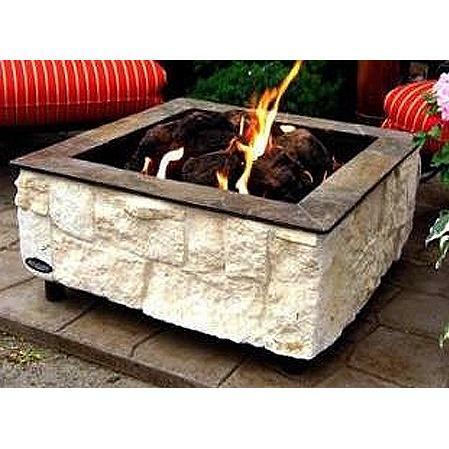 This FireScapes Square Fire Pit features a manufactured concrete stone finish with tones of white, cream, and grey, approximately 1/2 inch grey mortar between stones, honed blue-grey slate cap, galvanized steel and aluminum frame, 19 inch stainless steel double fire pit ring, two bags of lava rock, standard on/off ball valve with T-handle, 1/2 inch natural gas connection, and 65000 BTUs. No natural gas hose included. Approximate Item Dimensions (in inches): External: 30-32 W x 18 H (15 inch pit and 3 inch legs). Internal: 24 x 24. Warranty: all products are offered with a one-year limited warranty. Shipments cannot be expedited on this item. DOES NOT INCLUDE GAS LOGS OR ANYTHING PICTURED OUTSIDE OF FIREPIT.